Red All Over: After all the twists and turns of Utah’s football season, how will it end? Jason Shelley’s fill-in opportunity is yet another interesting development. (Trent Nelson | The Salt Lake Tribune) Utah Utes quarterback Tyler Huntley (1) as the University of Utah hosts Washington at Rice-Eccles Stadium in Salt Lake City, Saturday Sept. 15, 2018. Red All Over is The Salt Lake Tribune’s weekly newsletter covering University of Utah athletics. Subscribe here. As a developing story, this Utah football season has offered everything a writer could want. I remind myself never to overlook the human element of sports; these are real people, after all. The walk down the ramp to the Ute locker room last Saturday at Arizona State, being a step or two behind injured quarterback Tyler Huntley, is a scene that will stick with me. 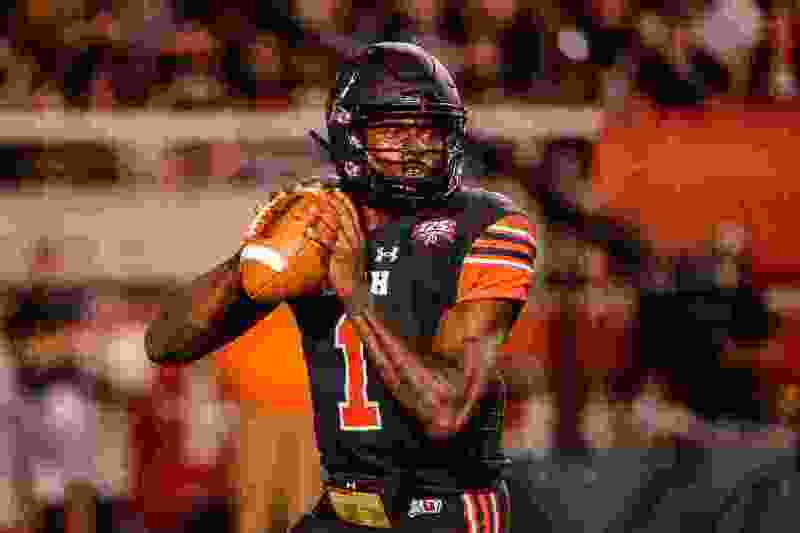 Without losing sight of how Huntley's being sidelined affects him personally, after he put so much effort into this season, I'm eager to see how Jason Shelley's opportunity turns out and where the Utes go from here. From the offense's struggles of September to Utah's dominant October to the uncertainty of November, this team has provided plenty of material. What happens now? We'll find out, starting Saturday vs. Oregon. • In football recruiting developments, the Utes received a commitment this week from Bingham High School linebacker Junior Tafuna. The recruiting website 247Sports said Tafuna had offers from Nebraska and Oregon, among other schools. The Utes also got a commitment from Lacarea Pleasant-Johnson, a cornerback from Mountain Pointe High School in Phoenix. • The Utah women’s soccer team produced an outstanding season, although the Utes didn’t receive an NCAA Tournament bid. Utah finished 9-8-2 overall and 6-4-1 in the Pac-12, good for fourth place. Utah is the conference’s highest finisher in 12 years to be overlooked by the NCAA selection committee. As some consolation, the Utes' 1-0 victory at Colorado last week likely knocked the Buffaloes out of the NCAA field. Utah’s Paola van der Veen was named to the all-conference second team and Hailey Skolmoski made the third team. Hailey Stodden was named to the all-freshman team. Carly Nelson was a two-time Pac-12 goalkeeper of the week. • After losing last weekend at California and No. 2 Stanford, the Utah women’s volleyball team will host Arizona on Friday (7 p.m.) and Arizona State on Sunday (1 p.m.) at the Huntsman Center. The Utes (13-12, 5-9 Pac-12) are tied with Cal for ninth place in the conference. • Ute golfer Kyler Dunkle posted his third top-five finish of the fall season, shooting 71-68-69 at Poppy Hills Golf Course to tie for fourth place in the Saint Mary’s Invitational. The Utes ended their calendar-year schedule by finishing 12th among 18 teams. The Triple Team: Jazz were ‘a little too nice’ against Rockets, says Rudy Gobert. Can they set a better tone?